They were up next for their try at the lab ray. Angela had never thought of the possibility of being here in person. She had always been happy with the colours and species of her pets. But when she adopted Kira, the little Kacheek told her that it had been zapped by the lab ray before, and wanted to again. So finally, after months of saving, they were standing outside the room of the mad scientist. Zzzzzzzzap! What was previously the blue Grundo in front of them had turned Mallow. He looked slightly bewildered as he examined himself, and saw that he had no arms. But his owner rushed over and helped him out of the room, both of them chatting in excitement. “Next,” said the mad scientist. Angela and Kira walked into the room. Kira gave Angela a reassuring smile, then walked to the other side of the room. The mad scientist positioned his ray, and Kira closed her eyes. Angela shielded her eyes in the sudden light. When she looked over at where Kira had been, though, her jaw dropped open. Firstly, and most importantly, Kira was still whole. She hadn’t collapsed, either, and didn’t bear any marks of injury. That was a bit hard to tell, though, since Kira’s entire body had transformed. The now-robot Kacheek turned around and looked at Angela squarely in the eye. But when she spoke, her voice sounded nothing like her old one. Her words were strange, too. Kira followed Angela, taking steps that just looked... mechanical. Neither of them spoke a word as they left the lab and the island. There was the sound of someone rushing to the door as Angela’s keys jangled. She was greeted by an excited-looking faerie Shoyru. “I’ll tell you in a moment, Dee,” said Angela. “Come on. Kira?” She put a hand on her shoulder, and moved her into the house. The other three Neopets all stared directly at Kira, who gazed back at them, looking distant and unconcerned. “Kira, do you want to sit here?” Kay said, patting the chair beside her. She was the youngest, and shortest, out of all of them, and being turned robot hadn’t changed that. Kay looked frightened, hesitated, and reached out a paw to help Kira up. “Accepted.” Kira’s metal arm fastened painfully around Kay’s, and she let herself be dragged up to the seat. She then made a strange sort of movement, kind of like she was shrinking, and then grew back to be sitting straight up, looking blankly at the opposite wall. Dee, who hadn’t said anything until now, frowned. “Are you sure that’s a good idea? It’s a risk... who knows what’s going to happen to her again?” He looked around at them and waited. Her pets waved and said goodbye as she left. All except for Kira. She sat still, facing the wall opposite. She replied in the same unnerving tone. “Accepted. Will proceed to room.” She rose, sort of unfolding, from the chair and stepped off it, landing on the ground with a metallic thunk. She then took slow, even steps out of the room, up the stairs, making mechanic noises as she did so. Dee, Kay and Leila hurried after her. When Angela returned to their Neohome that night, she told her Neopets that she had managed to make 12,000 neopoints. Their plan to take Kira to the lab didn’t quite work out, though. She absolutely refused to go back. “Come on, Kira, please?” Angela said. They tried pushing her, but that was no use, either. Kira’s robot body seemed to have something at the bottom of her feet which used to plant herself firmly into the ground. Nothing they did would make her move. “Not right now,” Angela said. “I’ve got too little money to gamble with in the stocks. I could try the Faerieland Employment Agency, though...” With that, she left the house. Dee was sitting inside Kira’s room. He was slightly worried about her — although she’d just been sitting there, for most of the time, he wondered if she would do something irrational if she wasn’t watched. So he had been sitting beside her, in his room, reading the Neopian Times and glancing sideways every few minutes. Having just finished reading the latest part of a series, he turned the page to the comics. Kira’s head turned then. She was reading the comics — or just looking at them, he couldn’t tell. Dee glanced at her. “What, this comic?” He pointed at the one with Doctor Sloth in it. He read it himself, and at the end, he rolled his eyes. “That was just lame. Seriously, what are they thinking, publishing something as stupid as that?” He flipped back to the short stories, and was soon absorbed in one of them. Angela returned home in good spirits. “Look here, guys!” She waved a Christmas Paint Brush in the air. But Kira flatly refused to go to the Rainbow Pool, similarly to the way she had refused to go to the secret lab. Angela was on the verge of tears. She sat down and buried her head in her arms. Dee looked at Kira angrily. “Gosh, can’t you just act normally again? This is all your fault!” He pushed her. “Dee!” Kay and Leila said at the same time. Kira had toppled over and hit the ground. Something fell out from her. “Kira! Are you all right?” Kay and Leila helped her up. Dee and Angela were watching, open-mouthed. Kay, Leila and Angela explained the events of the past two days to Kira, who looked totally bewildered and had no recollection of it whatsoever. Dee was examining the disc. “The moment after she was zapped,” Angela said. Angela cut in. “I don’t think so, either. 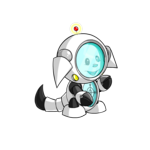 His lab ray zaps Neopets to turn them into different colours, different species and change their stats. Why would it be that Kira was the only one who started behaving like that when she turned robot? The Grundo before us...” She broke off, eyes wide. “Nah,” Kira said. “I kinda like this look.” She twirled around, but it didn’t quite work as her feet had automatically replanted themselves into the ground. When she hit her head against the wall, she straightened herself again, and all of them broke out into laughter. 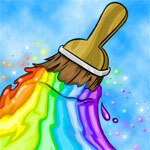 A Neopian's Guide to the struggles of finding and buying a paint brush. To color that blank slate inside me, I watch everything that goes on at my little corner of Neopia.